You may find it useful to be able to create and schedule appointments for your technicians without immediately giving those technicians visibility to their schedules. For instance, you may want to finalize a technician's schedule for next week without showing those appointments to the technician until you are finished. To meet this need, ServiceTrade provides the capability to release appointments to technicians. Appointments which have not been released to technicians do not appear in those technicians' mobile and tablet apps. Technicians who are subscribed to upcoming appointment email notifications also do not receive those notifications for unreleased appointments. You can release (or unrelease) appointments from the dispatch board and job page. Appointments that are currently released (visible to the technician) will have a green dot indicator. Appointments that are not currently released (not visible to the technician) will have a grey dot indicator. An unreleased appointment on the dispatch board. Click the "Release" button to release it. A released appointment on the dispatch board. Click the "Released" button to unrelease it. An unreleased appointment on the job page. A released appointment on the job page. 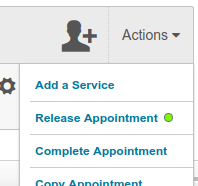 Release (or unrelease) an appointment from the job page by clicking the "Actions" menu and choosing Release Appointment (or Unrelease Appointment). IMPORTANT: By default, all newly created appointments are immediately released to technicians. However, account administrators can change this default behavior by going to Account Settings, opening the "Automatically Release Appointments" section, and choosing the appropriate setting for "Enable Auto Release". If you choose "Yes", appointments will be released automatically. If you choose "No", you must manually release each appointment to your technicians before they will see those appointments on their mobile and tablet apps. This setting will apply to all appointments for all of your technicians in all offices. Only newly created appointments are affected by this setting. Changing this setting does not change the released status of existing appointments.